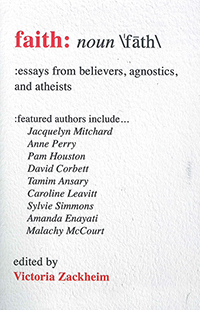 Whether believer, skeptic, agnostic, atheist, or something other, these twenty-four authors share a fascinating, daring, and multifaceted perspective on what faith means (or doesn’t mean). The collection of personal essays includes bestselling authors such as Anne Perry, who writes about a deeply spiritual faith that embraces and sustains her through every step of her life. Caroline Leavitt writes about tarot cards, mediums, and quantum physics to explain her concept of faith. Afghan-American author Tamim Ansary beautifully captures his childhood curiosity amidst his Islamic views. There is the irrepressible Malachy McCourt’s anti-religion rant, and then Pam Houston’s signature wit and sense of irony, which gives the question of faith a surprising twist.